Players again stand in a large circle with two people in the middle. One person in the middle is the President, the other is the Bodyguard. Those standing in the circle try to hit the president with the soft ball. The bodyguard may do anything to block the ball with his body: jump, squat, dive, etc. 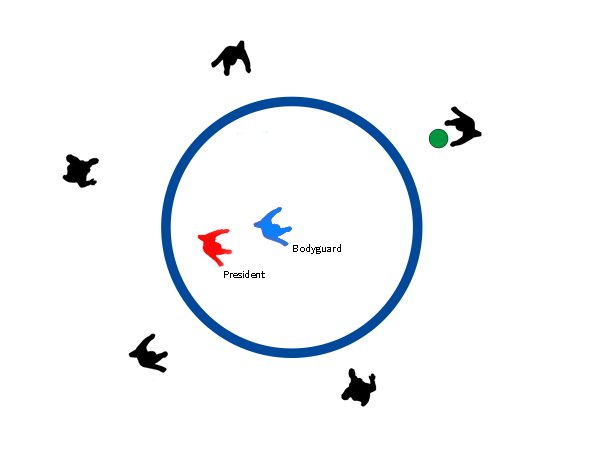 If the ball touches the President at any time [any part of the body, not just below the knees], the person who threw the ball (or the last person to touch it) then becomes the Bodyguard, the Bodyguard becomes the President, and the President rejoins the circle. What makes this exciting is that from the moment the President is hit, the new President is vulnerable as the transition is instantaneous. The new bodyguard must be fast at getting into the circle to defend him or her. This sometimes makes Presidential Turnover pretty quick, but it’s exciting. This game is exhausting, especially if the people in the middle are good. Hi! I`m Tamara and I just wanted to ask you is do you at least have a singing competition what everyone can compete at. Don’t have any singing competitions. Interestingly they do not feature much at all in the historic games and activities. I guess their popularity is more recent boosted by shows such as X-factor and [name your country] -got-talent 🙂 As for following comments 5 mins later expecting an immediate response. This is not a business website it’s just a resource run on a purely voluntary basis (since 1999) 🙂 There are no paid staff dedicated to the site.